The Roadmap view is called from the Note Menu or from the note's view icon's pop-up menu. The Roadmap lets you see all of the links leading to or from a selected space — the local area of a complex hypertext. Aliases have their own roadmap, not that of their original. The selected note will be shown at the top centre of the view, with a thumbnail view of its text below it (if you make the dialog/window bigger you can actually read the text). The left column lists all notes that are linked to this note. The right column lists all notes to which this note links. 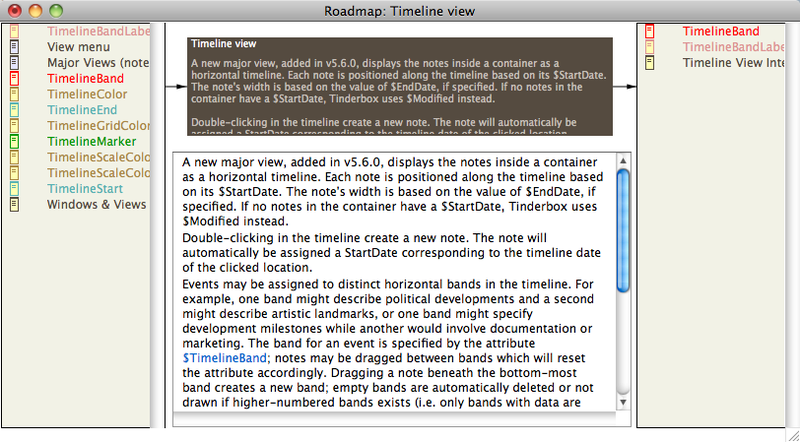 You can have many Roadmap windows open at once - each showing the links leading to and from a different note. To change the focus of a roadmap, double-click any note in either column. The Roadmap will change to show it as the central note, with links leading in and out of it in the two columns. Any open view windows will also change to make that note the selected note. Items listed in the in/outbound link sidebars can be the drop target for creating links and the context menu for a selected list item can be used to open new views, create basic links (from the list item), etc. Right click on any note icon in the right or left column for more options. The view's list is drawn with the TBX's $MapBackgroundColor. List item colours are darkened according to the (Map) Preference to Darken colors in charts and outlines.